This post will review changes in domestic consumption of cheese and butter. In 2017, cheese consumption was up 1.3% and butter consumption was up 2.6%. 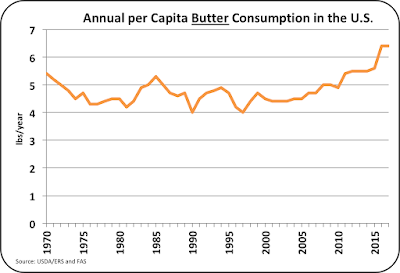 Per capita consumption was basically flat for both cheese and butter. Therefore increases in consumption were due mostly to population growth. The charts below cover the period from 1970 to 2017, nearly a half-century. The "straight line" appearance in Chart I indicates a steady gain in the quantity of growth. In other words, the annual gains are a steady amount, not a steady percentage increase. Consumption has increased a little more than 200 million pounds every year. Chart II shows the growth in per capita consumption. 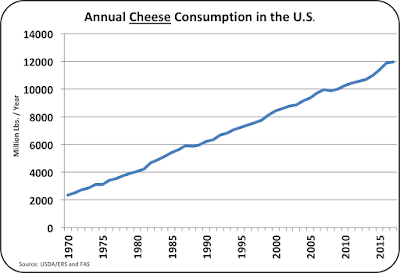 Over the last 47 years, Americans have increased their consumption of cheese by almost one pound per year. Prior analysis has shown that consumption of cheese is somewhat influenced by price elasticity, meaning that if cheese is more expensive, less will be consumed. The year 2017 was an exception. In spite of slightly lower retail prices for cheese in 2017, per capita growth was flat with the prior year. 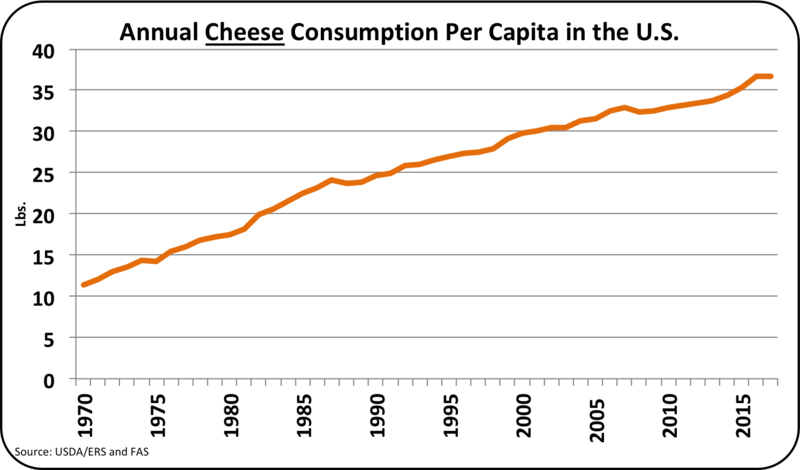 This may be a warming of slower growth in per capita consumption of cheese. 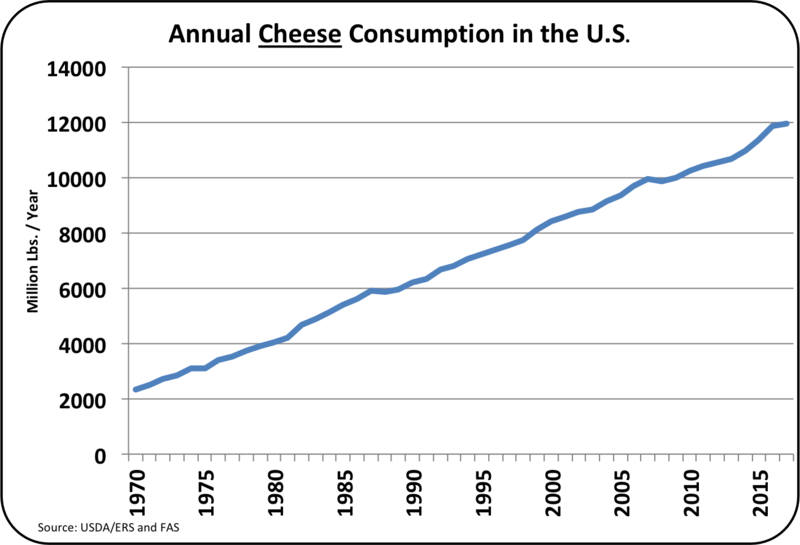 Over time, the percentage growth of cheese consumption in the U.S. has slowed. 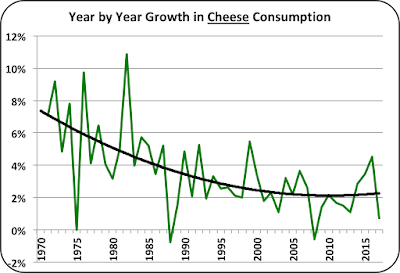 As shown in Chart III below, the growth of cheese consumption has slowed over the last half century. The growth has slowed from the 6% to 8% range to the current 2% level. 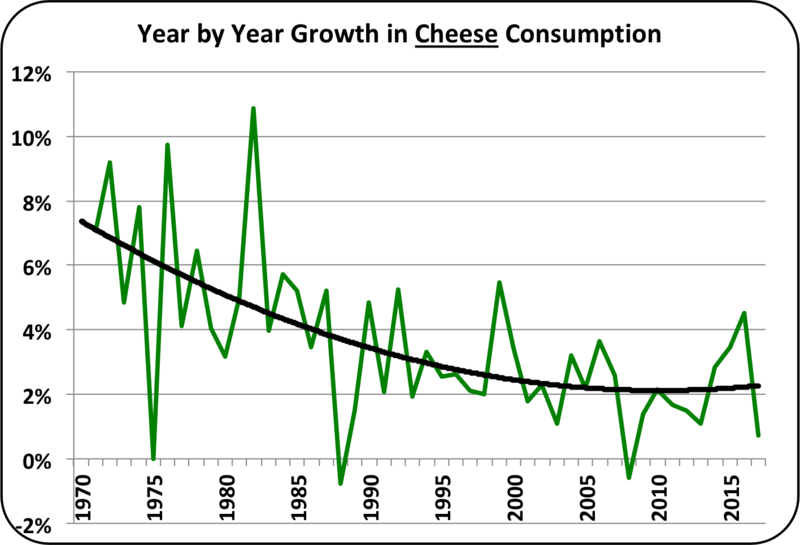 Two percent growth in cheese consumption will not sustain a 2% growth in the milk supply. While cheese is now the largest use for milk, the declines in consumption of fluid milk for drinking reduce the overall demand for milk. Consumption of fluid milk will be reviewed in detail in a future blog, but the decline has been going on for years and will no doubt continue. 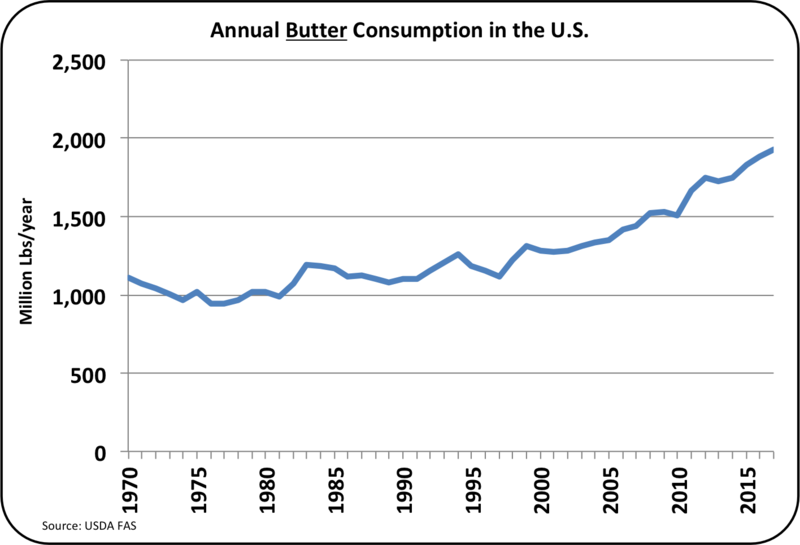 Butter consumption is up (Chart IV). It has been on a growth curve for around ten years. 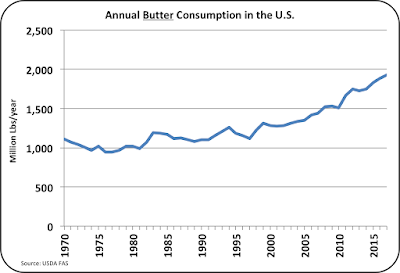 Since 1980, domestic butter consumption has doubled. This growth has changed the profile of milk usage and complicated the overall utilization of milk. Butter utilizes only a minor portion of whole milk. Of the roughly 12.2% overall solids in milk, butterfat accounts for about 3.5% of those solids. That leaves about 8.6% of the solids in the form on skimmed milk. Sales of fluid skimmed milk have dropped precipitously in the last five years. That leaves the only available use for skimmed milk as Nonfat Dry Milk/Skimmed Milk Powder. There is already too much in inventory. This a serious problem in the U.S. and the international markets. 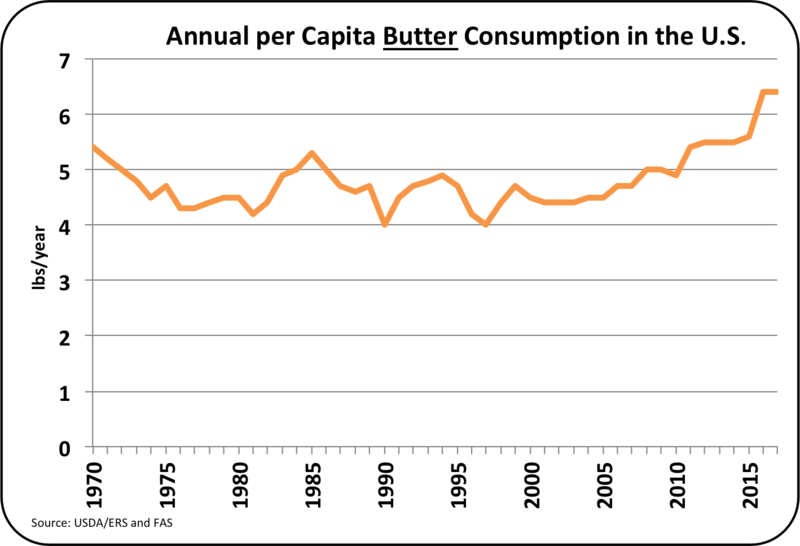 By the available data, the annual per capita consumption of butter (Chart V) flattened in 2017. Retail butter prices are high compared to alternative vegetable based spreads and the price elasticity may have dampened sales. 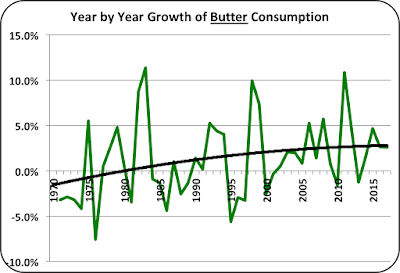 Chart VI shows the growth in domestic butter consumption since 1970. That growth is leveling off and is currently at about 2.6% per year. That level of domestic growth will still pressure domestic supplies and keep prices high. Currently little butter is exported and with these tight supplies, that will probably not change. 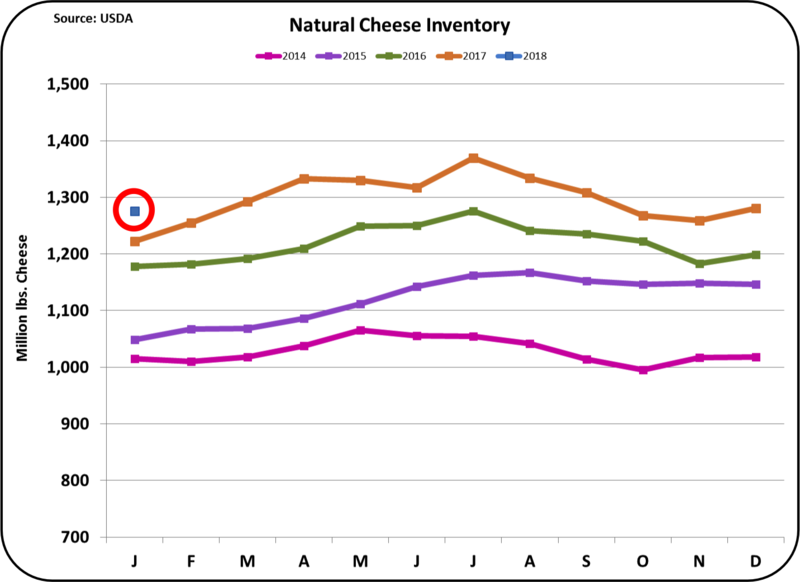 These analytics indicate a continuing story of the current dairy situation. 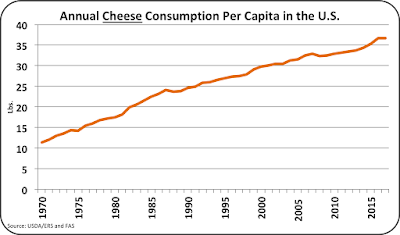 Domestic consumption of cheese will not cure the current high level of cheese inventories. This must come from increased exports. 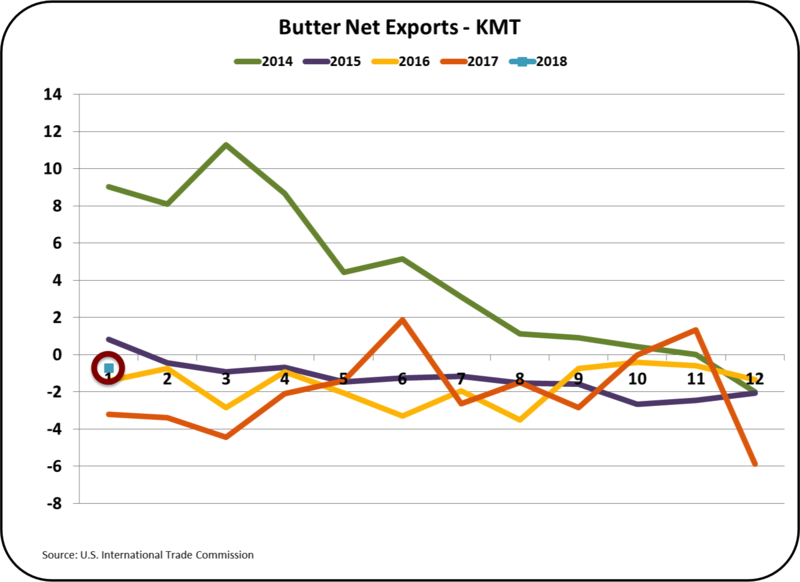 Domestic butter consumption will continue to put pressure on inventories and, as result, little butter will be exported. This confirms that the low current producer prices can only be improved by lower milk production or increased exports. 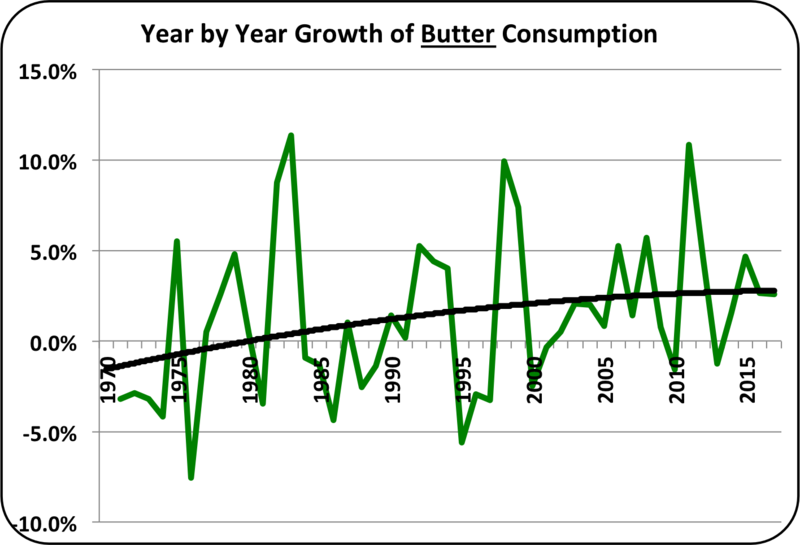 The continued growth of butter consumption will keep pressure on what to do with the remaining skimmed milk. 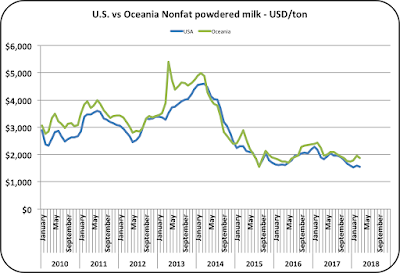 Low prices for Nonfat Dry Milk/Skimmed Milk Powder can be expected to continue. January 2018 exports showed additional progress more exports, chipping away at the high inventories reported in the prior post. 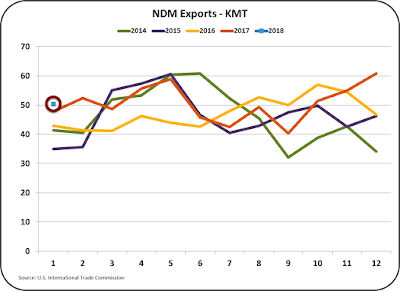 Compared to a year ago, exports of cheese, butter, Nonfat Dry Milk (NDM), and dry whey are all up. Imports are mostly down as well. This is impressive in a very competitive international market. However, at the current export rate, it will take a very long time to reduce the existing inventories to levels where commodity prices will rise and Class III milk prices will make significant gains. 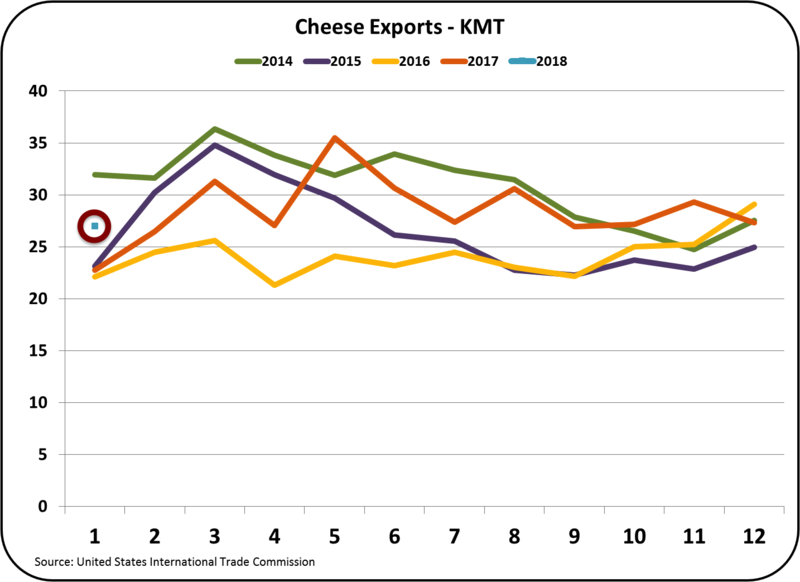 Current cheese exports are running at about 5.5% of cheese production. In 2014, cheese exports were about 1% higher. 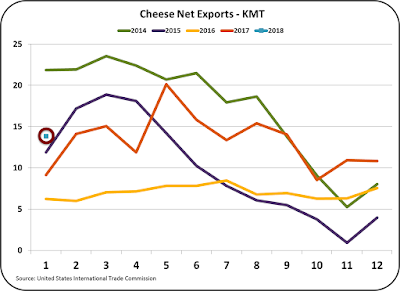 By comparison to 2014, 2018 cheese exports are still weak. 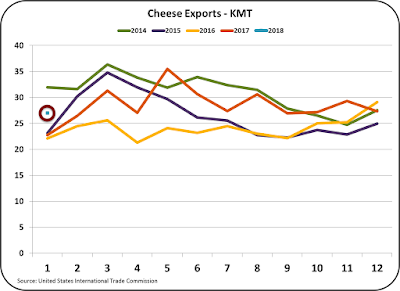 January cheese exports (Chart I) increased 19% over the prior year and were only exceeded by the extremely strong 2014 exports. Imports (Chart II) were down slightly from the prior year, which provided for a "nice" gain in net exports. 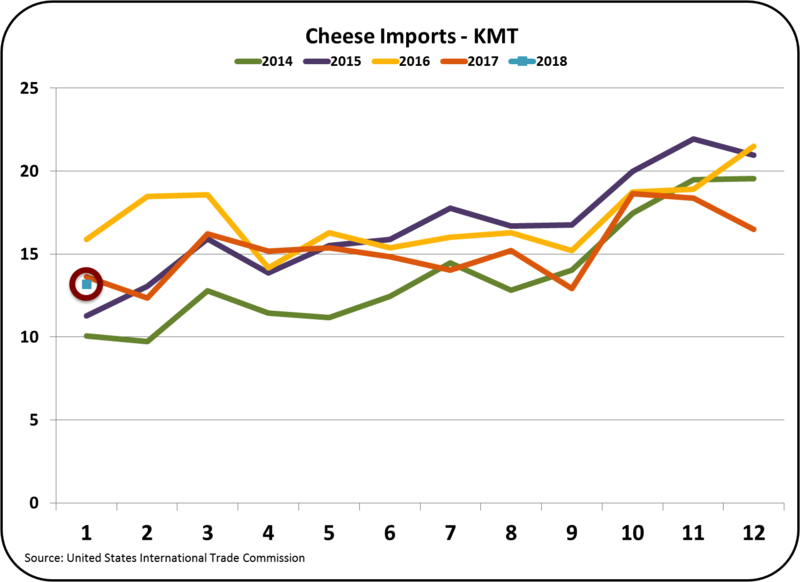 A 19% gain in cheese exports is huge, however even at this rate it will take months to reduce the high inventories. 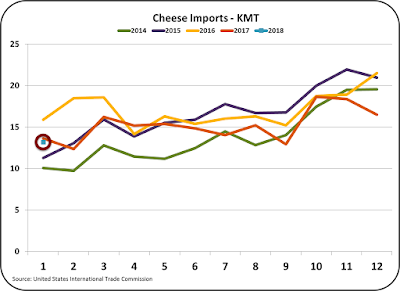 There must also be significant reductions in imports and production to reduce the cheese inventories to reasonable levels in 2018. 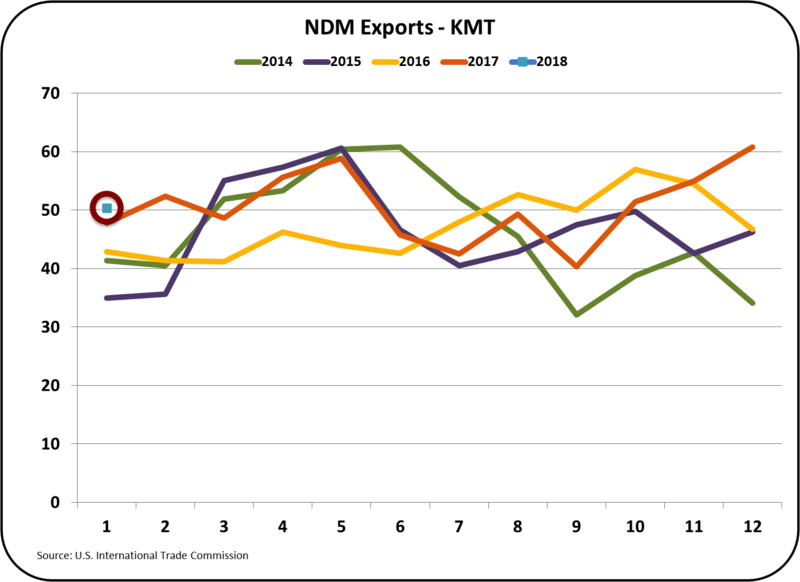 Exports of NDM/SMP (Chart IV) were at record levels for the month of January 2018. However, this record level of exports, if continued for months would not sufficiently reduce the huge inventory. 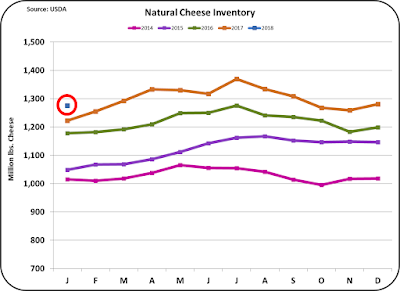 Like cheese, production must be reduced to help get rid of the very high inventories covered in the prior post. 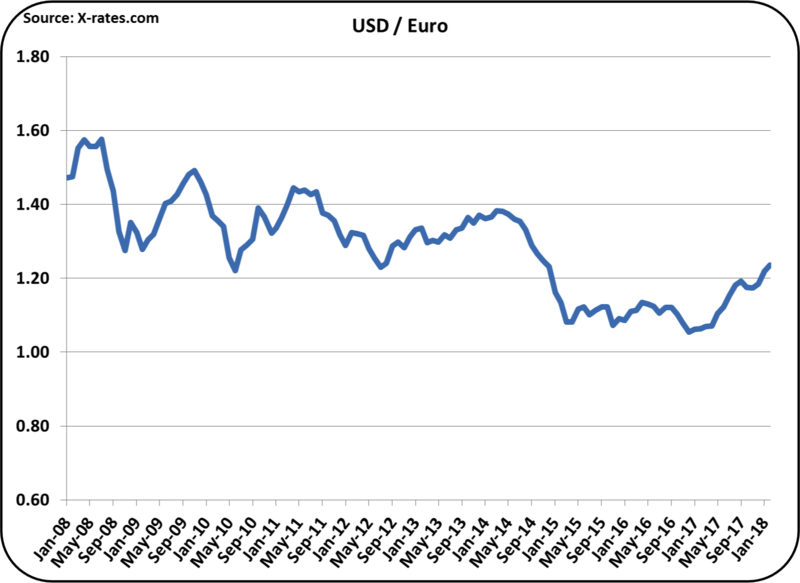 International prices for NDM/SMP (Chart VI) are the lowest in ten years. The price has been consistently low since 2015. Currently USA prices are the lowest. Because over 50% of the NDM/SMP produced is exported, the export price is the domestic price. Even with the low prices, only so much product can be sold. Therefore, the only way to sell is to be cheaper than the competition and let their inventories grow. 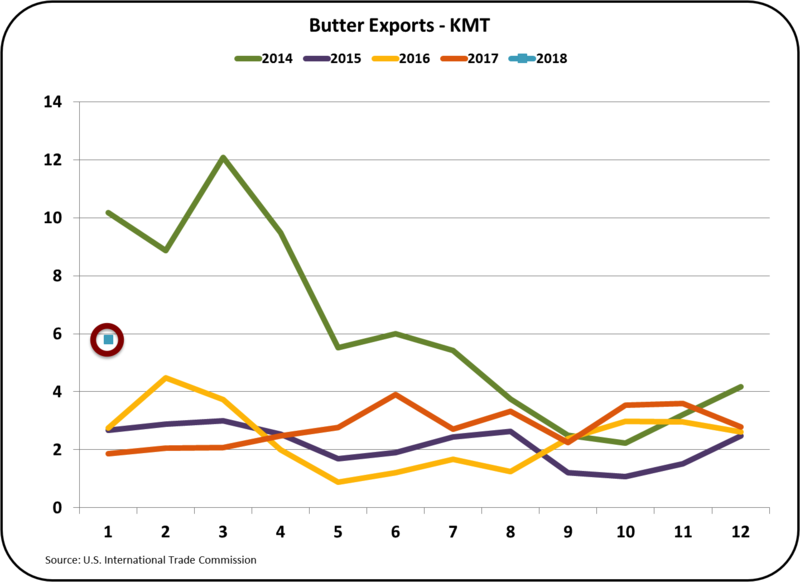 Butter exports are also up, but they still remain very small. 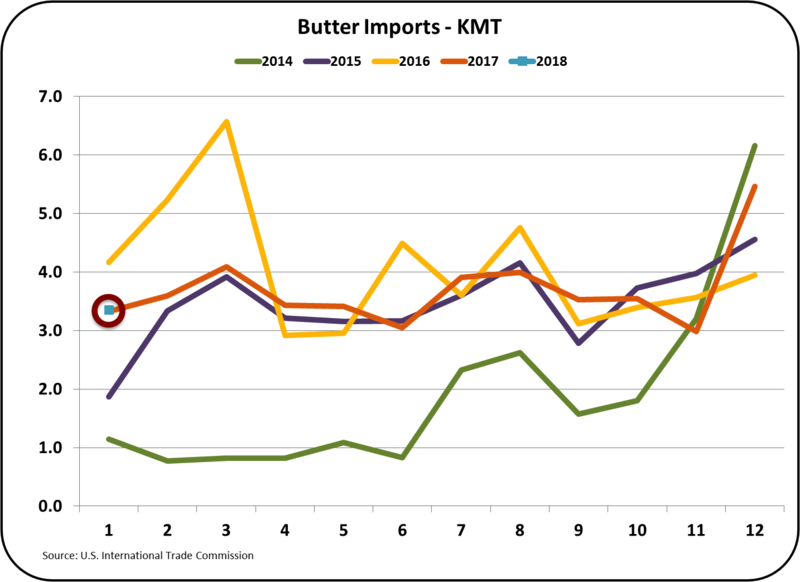 Butter imports are at the prior year levels and have been necessary to maintain adequate inventory levels of butter. This will probably continue and will keep the USA as a net importer at least through 2018 (see Chart VII). The U.S. is in a very competitive position to sell dairy products on the international markets. Milk is very available and affordable and exchange rates are favorable, the U.S. With low prices export sales will no doubt continue to grow. Right now, every major dairy exporter has excess capacity. 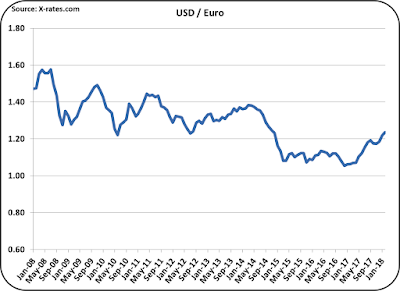 This global glut will have to be relieved by lower production globally before prices can improve. February 2018 Class and Component prices were consistently negative from the prior month. Why? Inventories were up again. 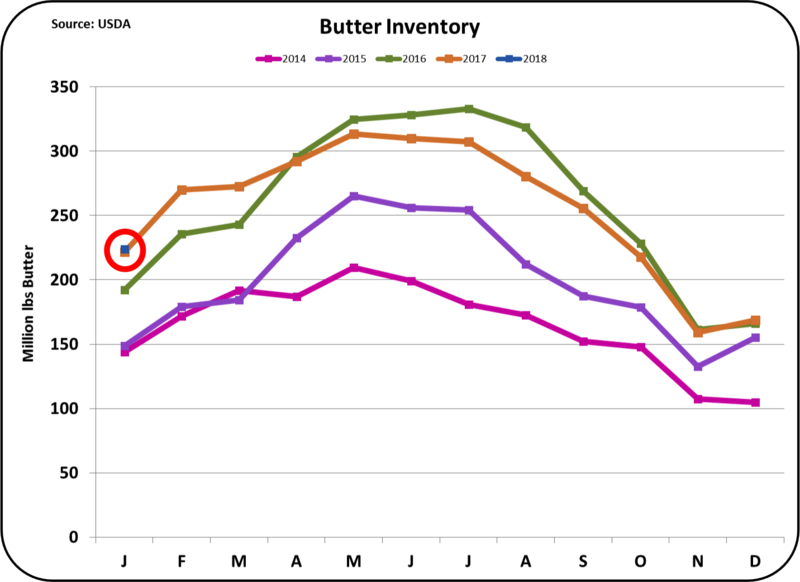 The only exception was butter, where inventories were at prior year levels. The inventory data that is available is for the end of January. 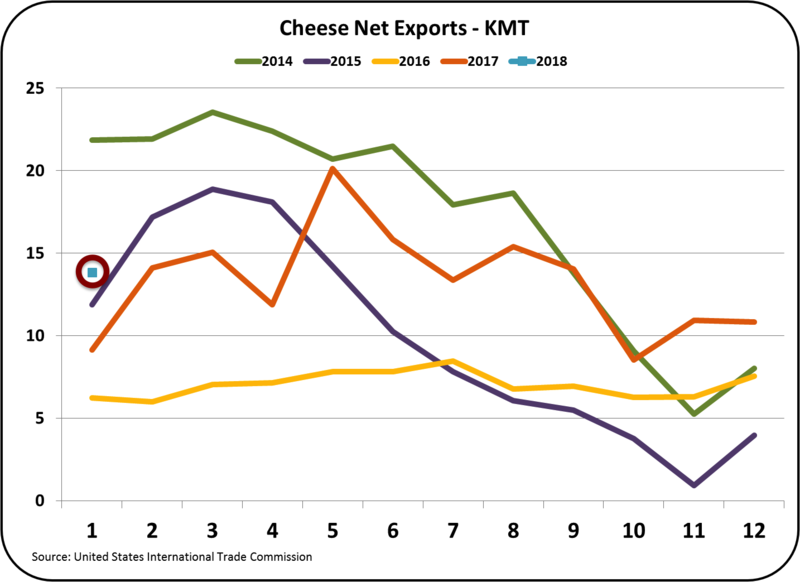 In spite of decent exports and reduced imports of cheese, inventories of cheese continued to grow vs. the prior year (See Chart II). The growth rate could be acceptable if there were not already excess inventories. 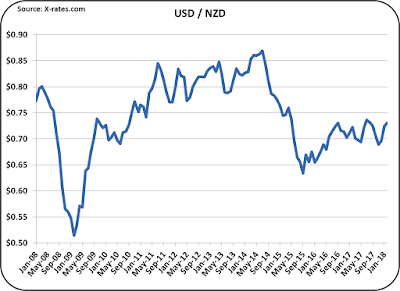 As covered in the prior post, if this production rate is continued, exports must increase dramatically and imports must continue to shrink to reduce the inventory. 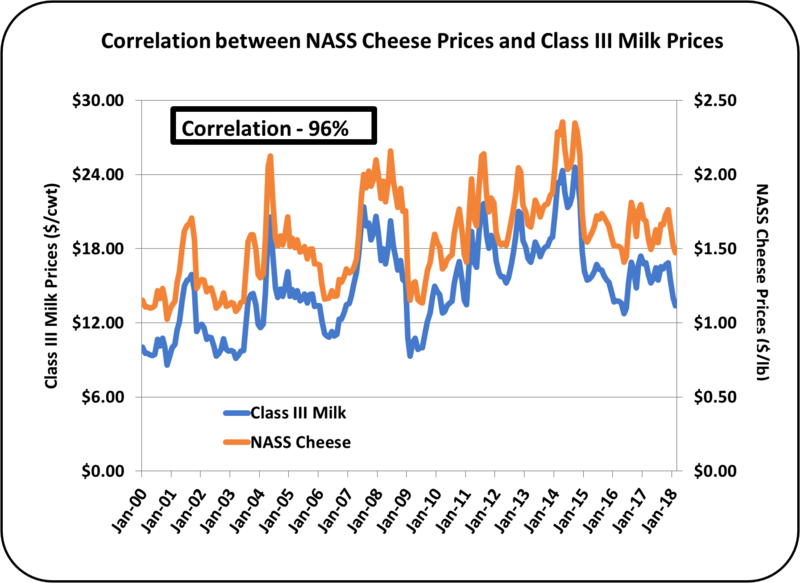 Because cheese prices are so closely linked to Class III milk price, the cheese inventory must be reduced before producer milk prices can improve. 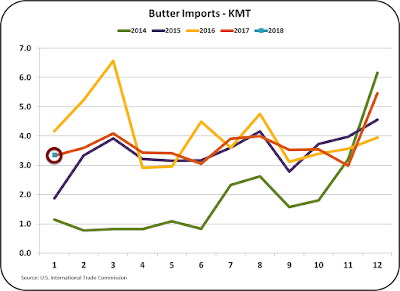 Butter inventories (Chart III below), continued very close to the year go levels, it is difficult to say why the current price is lower than twelve months ago. That said, there is no perfect market. 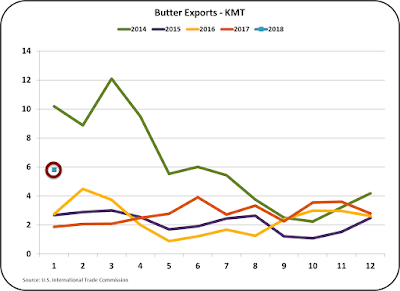 Butter production is up vs. the prior year, which could be playing into the lower prices. 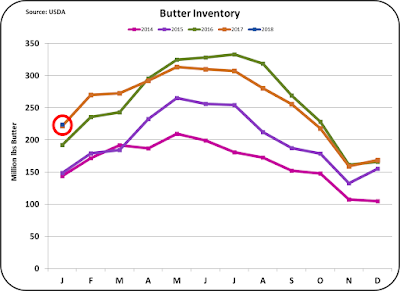 At any rate, butter inventories continue to be more is line than other dairy commodities used to price producer milk. One element preventing big increases in butter production is the issue of what to do with the skimmed milk that is left when the butterfat is removed. 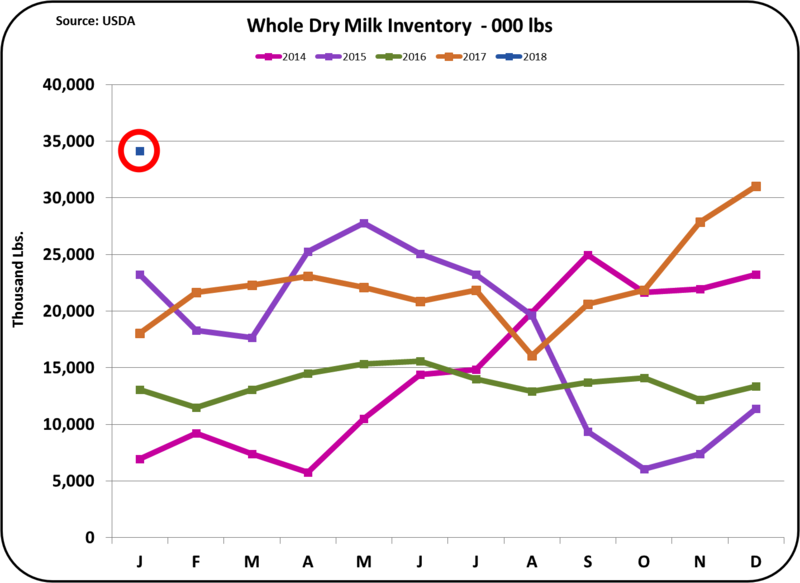 Increases in butter production could throw more skimmed milk on the market, which if dried would make the very high nonfat dry milk inventories (Chart IV) even higher. 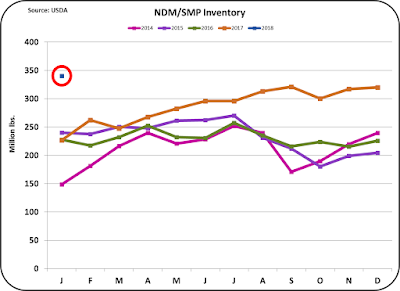 Nonfat Dry Milk/Skimmed Milk Powder (NDM/SMP) inventory is extremely high (Chart IV). The inventories are around 40% higher than "normal." To bring these inventories down to "normal" levels, exports would have to double for one month. Of course, that is impossible. A combined effort of reduced production and significantly increased exports would be needed to reduce these levels during the full year of 2018. We can therefore expect high inventories and low NDM/SMP prices for all of 2018. 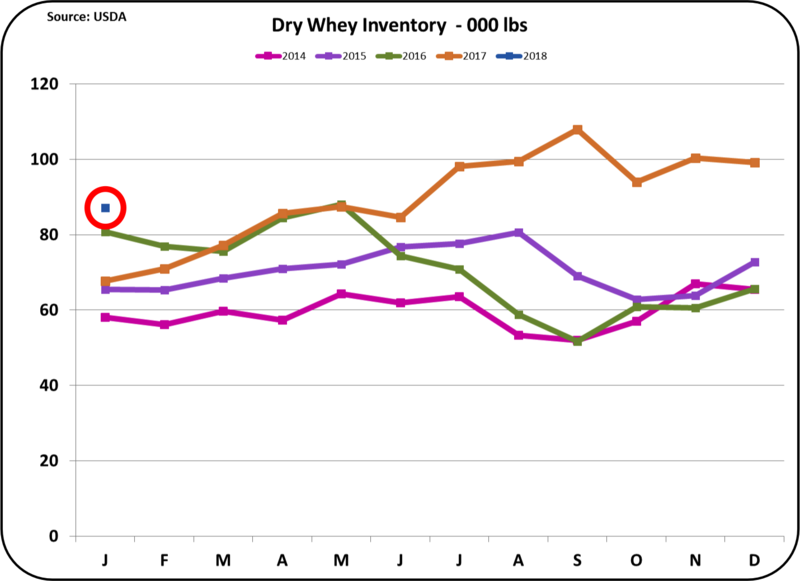 Dry whey inventory is also high, but down considerably from the Q4 2017 levels. 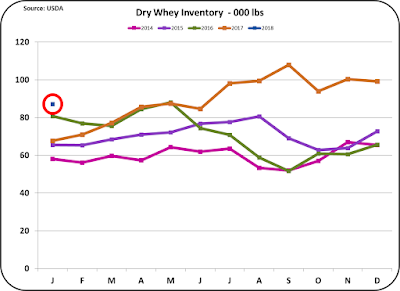 As mentioned in the February 5 post to this blog, because this inventory can be reduced quickly by drying less whey, inventory can recover quickly. Dry whey is primarily an export items and is subject to global price fluctuations. 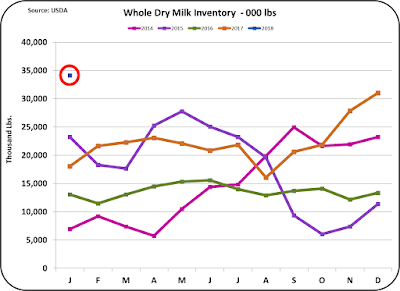 In addition to the four commodities used to price producer milk, the inventory Chart VI below for whole milk powder is included in this post. Whole Milk Powder (WMP) is strictly an export product. While WMP is a very large category globally, there is very limited need for it in the U.S. Because it does include butterfat, it requires refrigeration or an oxygen proof environment to prevent rancidity. While the WMP category is about 1/10th the size of NDM/SMP, it does provide an opportunity to store excess milk because WMP properly packaged does have a relatively long shelf life. The increased WMP inventory is nearly 50% larger than the prior year. Producer dairy prices are subject to extreme price volatility and it is very difficult to manage a business with extreme volatility (Chart VI). 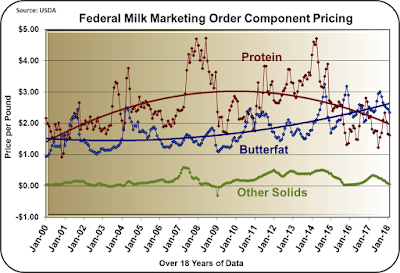 The price changes result primarily from inventory fluctuations of the commodities used to price milk components. Some of these fluctuations come from changing consumer consumption in the U.S. and producer over-production. 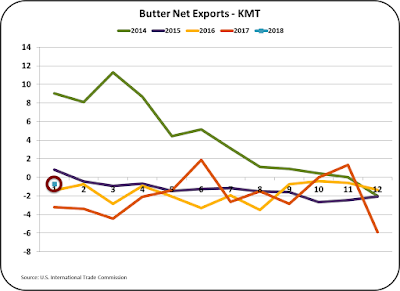 However, most of the inventory fluctuation can be traced to variations in exports and imports as dairy commodities are increasingly traded globally. Current examples of events that could increase milk-pricing volatility are changes in NAFTA, possible changes in tariffs countering U.S. tariff changes, and changing weather that could impact production in dairy exporting countries. 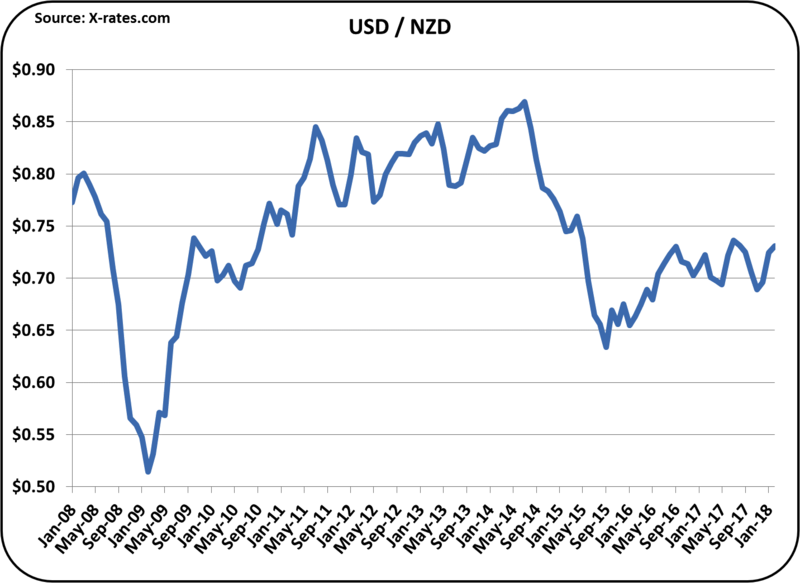 As dairy commodities are increasingly traded internationally, milk pricing will increase in volatility. Table I below provides another view of this volatility. By far, the volatility is greatest in the price of other solids. 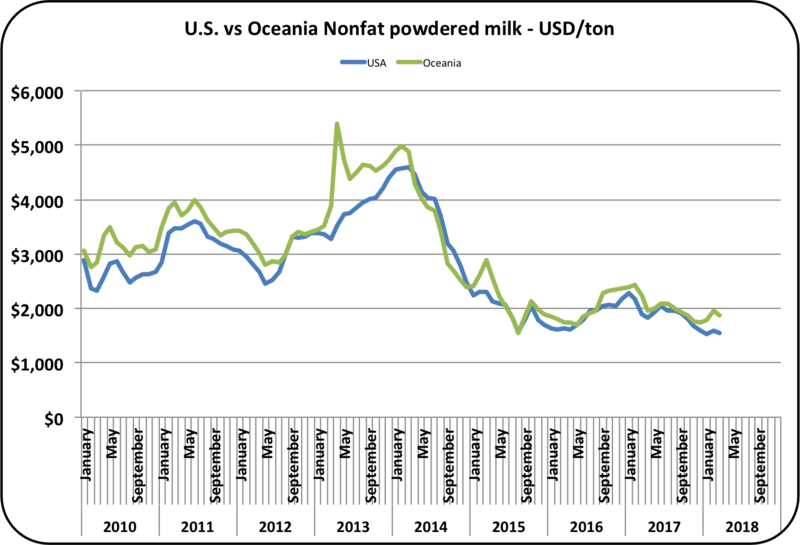 Over the last five years, the price of other solids have varied from $.03/lb. to $.50/lb. The price of other solids is calculated based on the price of dry whey. Dry whey is heavily exported and that makes the pricing dependent on international events and prices. Fortunately, the price volatility of other solids has a small impact on the Class III price. 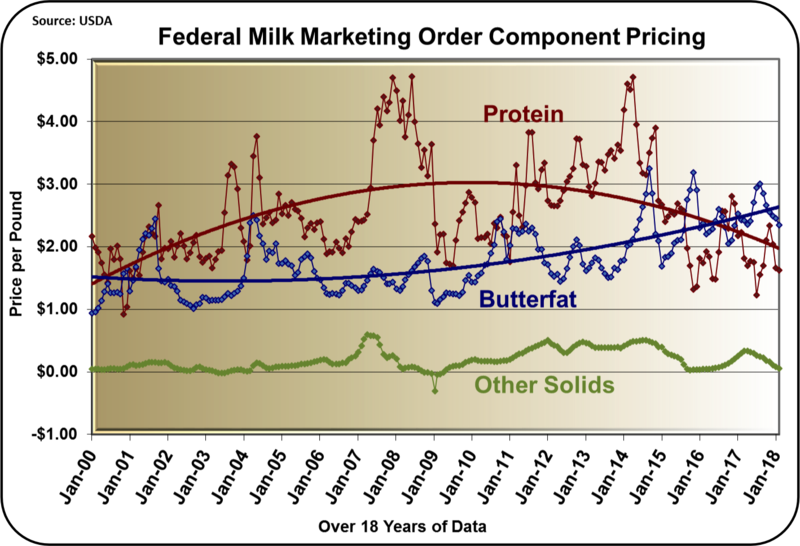 Butterfat has varied from $1.32/lb. to $3.25/lb. While the price has been very volatile, the volatility has been lower than either of the other two components, which make up the Class III price. The price of butterfat is based on the price of butter. Most of the increase in price has come from the increased per capita consumption, both domestically and internationally. 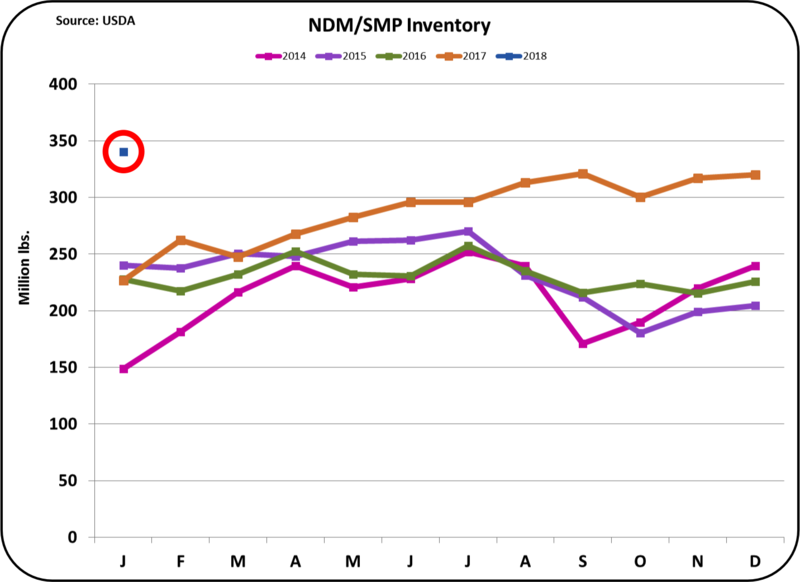 Meeting this demand has led to an excess of skimmed milk which in-turn is feeding inventories of NDM/SMP. Fortunately, the price volatility of butter has a small impact on the Class III price. Milk protein pricing is unique because the formula used to calculate the value of milk protein is based on two variables, the price of cheese and the price of butter. As the cheese price goes up, milk protein goes up in value. As the butter price goes up, milk protein goes down in value. 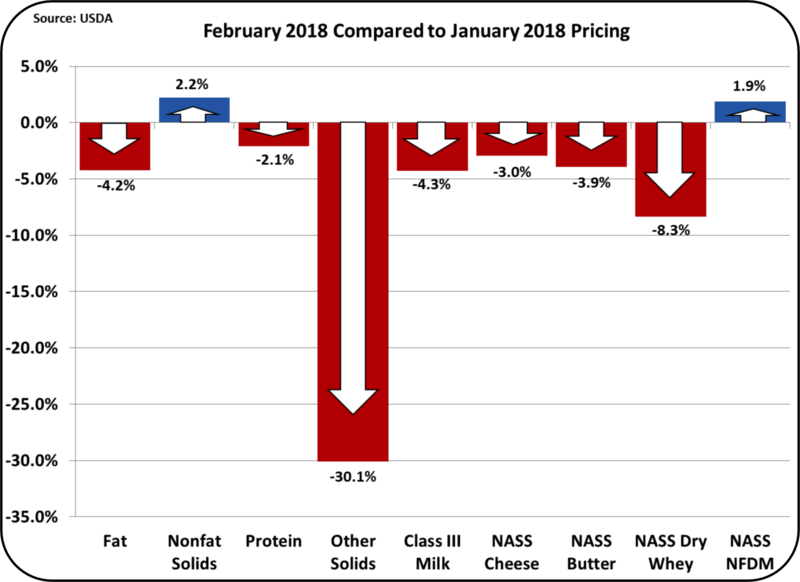 As a result, milk protein prices are more volatile than butterfat prices. 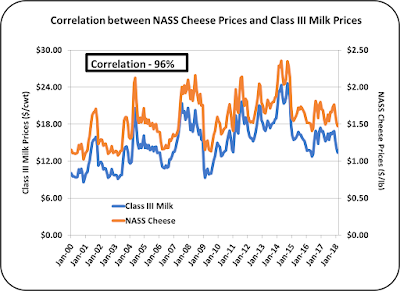 The price volatility of cheese has a huge impact on the Class III price as shown in Chart VII. Can milk component prices be accurately forecast so producers can "adjust?" Obviously, no, they cannot be accurately forecast. There are too many global variables that can change unexpectedly. News on future price changes are consistent only in the fact that they are inconsistent and contrary. As one expert predicts higher cheese prices, another predicts lower cheese prices, etc. As analyzed in a prior post, the best producer strategy is to always manage for maximum component levels with a consistent strategy. Strategies that chase the uncertain market with changing management strategies is a hopeless and frustrating effort.